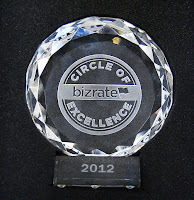 TobaccoGeneral: We're Circle of Excellence Bizrate Award winner! We're Circle of Excellence Bizrate Award winner! We're proud to announce that Tobacco General has earned the 2012 Bizrate® Circle of Excellence Award. We're among 94 online retailers, who received the award this year. We stand right next to stores like Adagio Teas, Aeropostale, B&H Photo, Bose, REI, Zappos. The award is based on customer reviews and ratings It reflects the quality of our service. We'd like to thank our customers for giving our store high marks. This is a big achievement for us and especially for people from our operations department, who always strive to provide customers with the best service possible. The award recognizes them as the best in the world. Thank you, guys! Thank you a lot!